Despite constant rain, it was a happy day. Peggy Haug married Juanita, her partner of 23 years. Peggy invited me to bring my sketch book and then suggested I try the view from the balcony. It was perfect, both for photos and for my sketch. This was at Immanuel Lutheran Church (ELCA) in the South Lake Union neighborhood of Seattle. 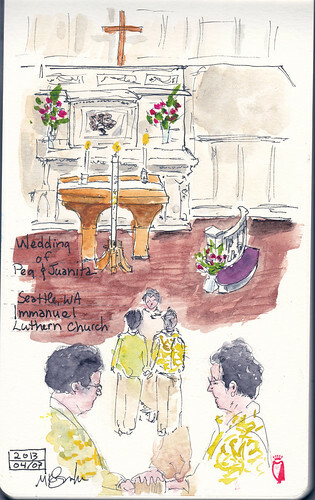 I sketched during some of the service in order to get the background done prior to sketching the ceremony. I've never sketched during church service before. I laughed a bit at myself: I wanted to stay in my seat to layer a wash in but the Gospel was being read. Sit, stand??? Argh! I stood and let the wash be. Liturgical propriety and respect won out over a bit of art. All but the larger portrait was done on location and during the ceremony. I added that at home. Congratulations, again, Peggy and Juanita! Wonderful tribute, Kate. Wish I could have been there. Hugs and WOO HOOS to Peggy and Juanita!! Really lovely, in sketch and in spirit. Brings tears to my eyes! Kate, how wonderful for you to record the day in such a personal way. What an honor to be asked to record such a special event.